Trailhead Location: The trailhead is located out Verde Valley School Road. Description: This hike provides wonderful views of Cathedral Rock. Take a short side trip down the Templeton Trail and in about 0.2 mile you'll be along Oak Creek. You can see the area called "Buddha Beach" across Oak Creek where visitors construct stone pillars from the river rock. You may be lucky and see hundreds of the rock structures. If you continue along the Templeton trail for another 0.5 mile you'll find yourself at the base of Cathedral Rock. 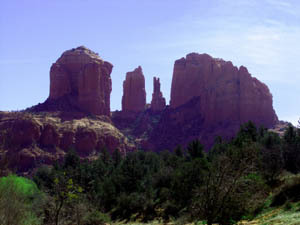 You have the option here of hiking up to the vortex located in the "saddle" of Cathedral Rock. Here's a link to a video for such a hike (http://youtu.be/haMtqhio-TI). Here's a link to the hike to the banks of Oak Creek using the Baldwin and Templeton trails (http://youtu.be/Zf4JooA0tow).